Toastmasters International is a non-profit organization dedicated to helping people improve their public speaking and leadership skills in a personal practice-based format. The organization has existed for around 90 years and has chapters in over 140 countries. HOW CAN I BENEFIT FROM TOASTMASTERS? HOW DO YOU CHECK IT OUT? 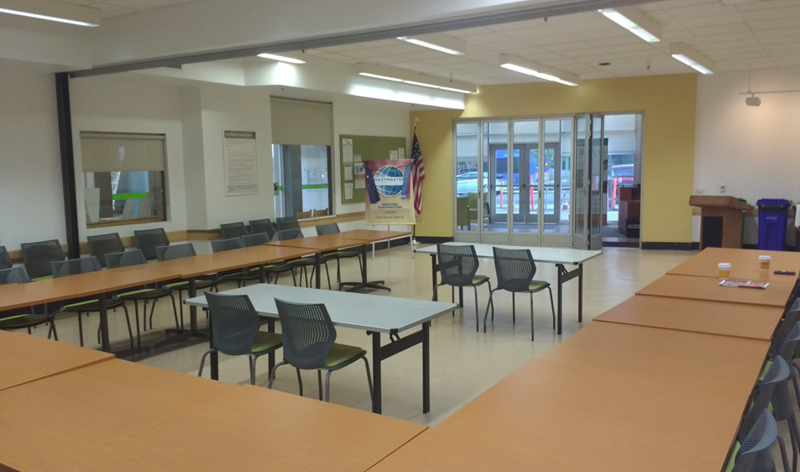 Feel free to stop by and sit in on any one of our meetings - no reservations or prior arrangements required! Every Wednesday night 7:00p.m. to 9:00p.m., except on major holidays. Parking is available beneath the building including company spaces (OK to park there after 6pm). Another close parking option is the Santa Monica Place shopping center across the street. If you are coming by freeway you would head west on the Santa Monica (10) freeway until the very last exit for 4th and 5th Streets before the freeway changes direction and morphs into the Pacific Coast Highway. After getting off the freeway at the 4th and 5th Street exit, stay over to the right of the exit ramp, turning right on 4th Street. Proceed through the light on 4th Street, crossing Colorado Avenue. 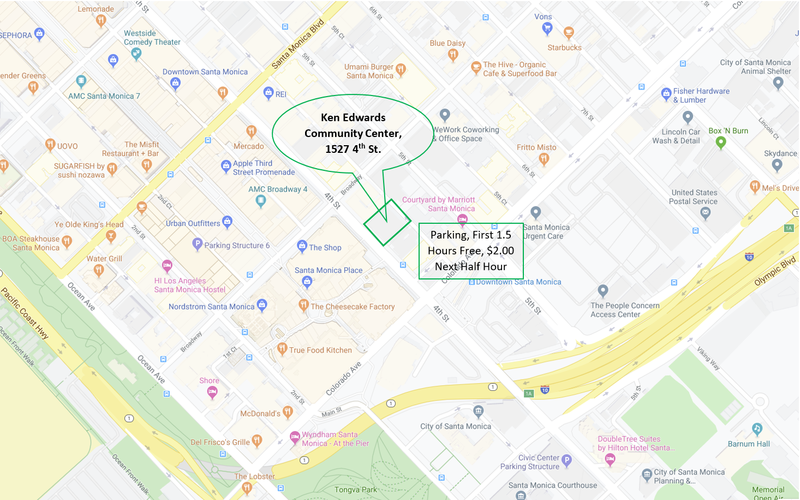 The Ken Edwards Center is on the right hand side of 4th Street in the middle of the block (between Colorado Ave. and Broadway St.). An excellent alternative is using the Expo train on the Los Angeles Metro system to come to a meeting. The final station for the Expo train in Santa Monica is one half block away on 4th Street from our Ken Edwards Center meeting location. As a first option you can park beneath the Ken Edwards Center. The driveway to the parking is in the middle of the block off 4th St and comes up quickly, with no sign out front, so you will have to pay attention. The rates are the same as other Santa Monica municipal lots; the first ninety (90) minutes are free and the next half hour costs $2.00, with each subsequent 30 minutes costing $1.50. Toastmaster is a very low budget non-profit organization, consequently we don't validate parking receipts. Another parking option is across 4th Street in the Santa Monica Place shopping center. The parking rates there are the same as noted above for the Ken Edwards Center. To visit as a guest for any number of meetings, absolutely free. To join as an ongoing member the club dues are $17.00 per month, collected semi-annually. There is also a $20 one-time fee for getting setup within the Toastmaster system. WHAT IF I'M NEW TO PUBLIC SPEAKING? No problem at all if you are a complete "newbie". Though the composition of club changes, there is always a mix of new members and more experienced speakers that one can watch and absorb more refined technique from. We believe Toastmasters provides a 'safe' place where you can take risks as a public speaker -- better to use those opportunities here so you are on your mark when in the real world. You decide when you are comfortable to assume greater speaking responsibilities. A typical meeting has three different speaking sections. There is an impromptu / extemporaneous speaking section (called Table Topics) that gives members practice in thinking quickly and coherently on their feet as we must all do at times in real life. A second part of the meeting concerns prepared speeches or leadership exercises with topics of the presenter's choosing. The third major portion is an evaluation phase to provide constructive feedback to the speakers with prepared speeches. Where they did well and where they can improve. HOW DO YOU PROGRESS THROUGH TOASTMASTERS? The foundation of the Toastmasters program is called Pathways, offering ten separate educational paths members may choose from for delivering presentations they would prepare to refine their speaking and leadership skills. Members work through the sequence of presentations at their own pace, acquiring the essential building blocks of communications technique, while building confidence. As you build competence in your skill set you will be presented with progressive challenges to further broaden your technique, turning you into a well-rounded communicator and leader. Additional paths within the Pathways framework can be pursued to extend your skill range across disciplines. Another opportunity to build your expertise within Toastmasters is to participate in periodic speaking contests, held annually. These advance from head-to-head competition within each Toastmasters chapter to successively higher levels outside the club. A brief overview of contests may be found here.